Finishing up the ADU construction in the summer of 2011, my partner and I were attempting to make tens of good, long-term design decisions about the final look and feel of the ADU. From the placement of outlets, to the colors and style of granite countertops in the kitchen, to how to build attractive built-in cabinetry in the bedroom cheaply, there was so much to figure out quickly. Having never worked with concrete, I was at a loss about how to correctly finish the concrete. I went to Home Depot and found a concrete stain and was able to easily apply a beautiful, rich red stain to the floor with a roller brush. Then, I applied a sealant, and voila, within a matter of hours, the drab grey concrete was a glossy red. It looked awesome. Fast forward 2 years, 6 months, and I was no longer so psyched about the wonderful looking concrete floor. Over time, the stain gradually wore off to the point where it diminished the aesthetic of the ADU. It was a cool process to observe where it wore off . Any guesses where the it came off quickest? Answer: The kitchen- where we apparently spend the most the time walking around. At first, there were just little white nicks, but eventually, the concrete looked ragged. I was frustrated because I'd stained and sealed the floor, but I came to learn that the product that I'd used wasn't really an absorbent stain; it acted more like a paint. And, like paint, it eventually peeled off. In January, I decided to bite the bullet and re-do the floor altogether. I researched options on how to refinish concrete floors, and eventually learned that the only viable approach to getting a good finish on the concrete floors would be grind down the existing surface. Then, we would have to re-stain the concrete with an acetone mixture that would actually penetrate the surface and stain the top 1/8" of concrete. The process included grinding down the existing concrete with a 4 grit, 8 grit, 16 grit, 32 grit, 64 grit, all the way to an 800 grit, to give it a polished finish. The stain/acetone mixture was sprayed onto the floor into the final passes. This concrete staining process is referred to as acid-etching. Lastly, a very thin protective was layer was applied. To prep for this job, we had to move everything off the ground floor of the ADU. Then, we took off on a road trip for the long weekend, and let professional concrete contractors work their magic. A big part of their job was taping off the entire first floor so that the concrete dust wouldn't cover everything. They were extremely thorough, nonetheless, concrete dust still managed to seep through and coat some of the walls. Here are pictures of the process. They spent two long days re-doing the 500 sq ft concrete floor. 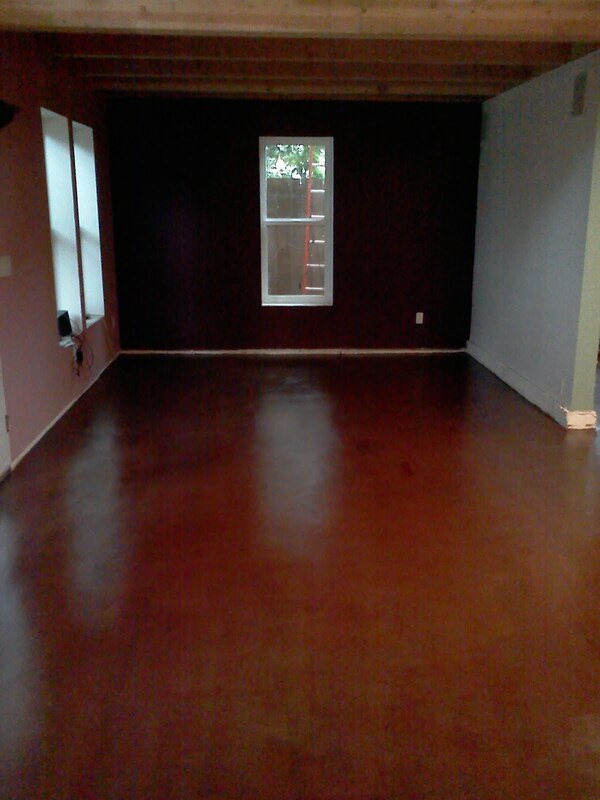 When they were finished, the floors looked awesome, as shown below. Unlike the paint-like stain process I did initially 2.5 years ago, this new stain should remain looking glossy and rich for years and years to come. This job cost $2,500. It wasn't cheap. I asked the contractor how much this job would have cost if I had hired him outright at the beginning. He said it would have cost the same amount, which surprised me. So, in the end, my initial stain job wasn't a mistake that ended up costing me more money. Rather, it simply required some additional work to move everything out of the house for the weekend. In hindsight, I would have sought and asked for a concrete foundation company that would have been willing and able to do all of the concrete work, down to the polished finish, and sought input on how best to get to the final glossy look that I was seeking initially. This would have allowed me to avoid the annoyance of refinishing the concrete floors. Like many building trades, concrete work has a lot of specialized processes, and I have found that having specialists scope out, advise, and in this case, execute the project, was critical to getting a final product that met my expectations. Great blog.Thanku for sharing this informative blog. Flooring is a vital element for a perfect home décor, for this reason you have introduced art to the contemporary flooring which gives ultimate attractive finish. Thanks for sharing such a descriptive blog. If you want to use the concrete services in EL Dorado Hills then no need to worry. All the concrete services are offered by EL Dorado Hills concrete company. *Senior Discount. Since 1993, ACI has been providing asphalt patching and repair, crack sealing, concrete maintenance, catch basin adjustment and other services. Nice blog and very informative article.Thanks for sharing such an amazing experience with us. Keep posting like these articles of concrete floor construction.